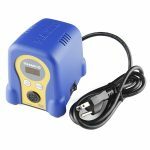 I recently purchased a Hakko FX-951 for home soldering. I was considering the FM-203 in case I ever wanted SMD tweezers, but the cost difference just didn’t add up. But, I knew that the Hakko FX-888D supported a SMD tweezer upgrade for less than $200 in case I ever needed them. But, I didn’t need the whole station, and the cost of the whole thing ($100 or so). To eBay I went, and found a “as-is” base for less than $40. It was missing the power cable, but showed to power up, and showing the “S-E” error. But it also didn’t have an iron plugged in, so that error makes sense (“S-E” is sensor error, claiming it can’t see the temperature of the iron)! When I got the base, it was a little worse for wear, but not terrible. The cord was cut right at the base, but replacing it was easy as I just had to unscrew 4 screws, unsolder the remainder of the cord, and then “donate” an old computer cable to it. Total time for that was 10 minutes. Next was checking the operation. I have an older FX-888 (analog) at work, and the hand-pieces are compatible. So plugging that in and testing worked perfectly… sort of. I had reset the unit to factory defaults because I wasn’t sure if any calibration adjustments had been made, and low and behold, that resets it to prior to the factory calibrating it as well. Thankfully I had my knockoff FG-100 and I was able to re-calibrate the iron back to within tolerance. After that, the base worked great. I have no clue, at all, why the cord was cut off. I even contacted my friend at Hakko Customer Service, and she confirmed the unit was legit. I also purchased a knockoff (though the eBay seller wouldn’t admit it) iron for the unit. While that iron showed up defective (the soldering in the DIN connector was abysmal), I quickly repaired it and confirmed the unit worked with knockoff hand pieces as well. All and all, not bad for $40, and when I get around to buying the tweezer kit for it, I’m sure I’ll get plenty of use out of it. Plus, it matches my FR-810 and FX-951!